After a day of walking from exciting boutiques to specialty stores you are guaranteed to work up an appetite. There are so many delicious restaurants to choose from that it will be easy to please everyone in your family. Among the many restaurants in Barefoot Landing and in North Myrtle Beach, South Carolina, you will find restaurants that serve some of the most delicious, fresh, local seafood for which North Myrtle Beach is know. Shrimp, flounder and all-you-can-eat crab legs will be easily available on most any seafood menu in the North Myrtle Beach area. Between all the relaxation poolside, fresh ocean air, shopping, sightseeing and amazing food make sure to catch one of the unforgettable live shows that North Myrtle Beach, South Carolina has to offer. The House of Blues and the Alabama Theater are just two of your choices that will be sure to provide an outstanding show everyone will enjoy without having to spend time traveling. For dinner and a show be sure to stop by Medieval Times and Pirates Voyage as they are both dinner theatres in the Myrtle Beach area. North Myrtle Beach, South Carolina also provides a rare animal adventure at Alligator Adventure or venture off down the road to more of the Myrtle Beach area. From your North Myrtle Beach resort you can easily take in all that North Myrtle Beach, South Carolina and the Myrtle Beach area have to offer. Take the family to visit Ripley’s Aquarium or explore the terrific shopping, delicious food and music-filled nightlife at Broadway at the Beach. Stop off for family fun, racing go-carts or gather your courage to take a ride on the famous Myrtle Beach SkyWheel that will take you 200 above the Atlantic Ocean and the Myrtle Beach Boardwalk. The Myrtle Beach SkyWheel is located on the Myrtle Beach Boardwalk. It goes along 1.2 miles of the beautiful Atlantic Ocean. The Myrtle Beach Boardwalk has great shops for shopping, delicious restaurants for lunch and you can even stop by an ice cream shop to grab some cool ice cream on a hot day. There is an exciting arcade to try your luck at some fun games and win some great prizes. You might even be able to have a seat in the park, facing the ocean while you listen to an amazing live band. Keep in mind that Myrtle Beach is the World’s Golf Capital. Without a doubt, you will be able to find a Myrtle Beach area golf course that you will be sure to visit time and time again or maybe you will love so many that you won’t be able to pick a favorite Myrtle Beach area golf course. Myrtle Beach, South Carolina has over 90 golf courses to choose from, 40 of them are championship golf courses. It won’t be hard to pick one that is close to Emerald Cove I. If you have never played a game of golf before you can take a lesson at almost any course and get easily hooked on Myrtle Beach’s favorite and popular outdoor sport. After a morning on a Myrtle Beach area golf course you might want to try one of the water sports offered in the area, including a banana boat ride, a dolphin watch cruise or a guided fishing trip. Take an afternoon to charter a boat for deep sea fishing. Grab a fishing pole and catch a prize fish from the Cherry Grove Fishing Pier or reel in dinner from one of the sandy beaches. Try parasailing. 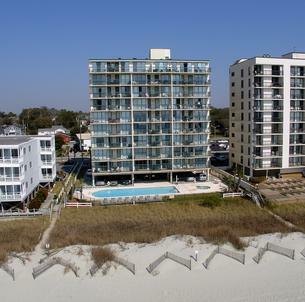 From the bight blue sky you can enjoy the ocean breeze while getting to see North Myrtle Beach from a different view. When you look down to the ocean you may get a glimpse of some dolphins. It truly is a sight from that different point of view that you will enjoy. Whichever activity you choose it will be a wonderful family experience complete with uncontrollable laughter, warm sunshine and incredible memories. Elliott Beach Rentals is not affiliated with onsite management or the HOA of Emerald Cove I.